What do we think education means? What do we believe are teaching’s purpose, status, and function in society? A useful way to reflect on our pre-conceptions and assumptions about anything is to step back and consider the metaphors we automatically apply when thinking or speaking of it. This is a particularly useful exercise for the trainee teacher, who, for obvious reasons, is likely to frame teaching primarily in terms of a performance – something that is observed, analysed, graded and, if all goes well, given the pedagogic equivalent of a five star review. For the experienced teacher, this same metaphor will re-emerge from time to time in the face of inspections, institutional self-evaluations, and peer observations; but it is likely to become obsolete as newer, more productive ideas about teaching develop over time. A dominant metaphor can not only tell us about how the teacher positions herself in relation to her role, but also about how that role is regarded by society. We talk increasingly, for example, of a teacher ‘delivering’ the curriculum. The teacher is construed here as a delivery agent, a go-between whose role is to present to learners a curriculum which has been conceived, devised, and constructed elsewhere. The idea of delivery in itself suggests a one way process that discounts the possibility of dialogue, critical enquiry, and mutual learning. So could there be a potential contradiction here between this concept of the role and our wider understandings of what it means to be a professional? And if so, will the teacher who is encouraged to see their function primarily in terms of ‘delivery’ experience any less satisfaction in their work than the teacher who would describe their professional practice in terms of ‘nurture and nourishment’? These are interesting questions; and part of the answer, of course is that most experienced teachers will view their role differently over time and according to circumstance; some days it’s an endless postal round and on others it’s all the joy of conducting the Royal Philharmonic through Beethoven’s Ninth. This is not just a question of language; nor is it a roundabout way of posing the key question about the primary purpose of education: whether it is to serve the economy, or to nurture the potential of each individual, or – somehow – to do both. As Lakoff and Johnson (1980) point out, our entire conceptual system is in its very nature metaphorical. We think in metaphors and they play a large part in defining the way we perceive our everyday reality. When we talk of a teacher ‘conducting’ a lesson, therefore, we’re introducing a whole range of assumptions about role and function, and at the same time applying judgements about value, which are quite different to those we may infer when we hear of a lesson being ‘delivered’. Metaphors can also succinctly encapsulate certain expectations or models of educational practice. A good example here is Paulo Freire’s description of the hierarchical and instrumental approach to teaching and learning as a ‘banking’ model. Here, the teacher is seen as the repository and dispenser of knowledge, and the learner as recipient; an unequal power relationship in which knowledge or skill is viewed as a commodity and which offers no potential for genuine development either of the learner or the teacher. We might contrast this with the metaphor of education as exploration, a joint enterprise and mutually fulfilling adventure undertaken by teacher and learners together. And then there is the metaphor of the farm or the garden in which the teacher nurtures successive ‘crops’ of learners; or even the image that sometimes surfaces of education as war, in which the teacher is pitted against the learners in a battle of wills to subdue, shape, and eventually socialise them. Indeed, the metaphors we find ourselves inhabiting can provide us with insight into just what it is we think education is for. Image Credit: “Orchestra” by Hans Splinter. CC by ND 2.0 via Flickr. Susan Wallace is Emeritus Professor of Education at Nottingham Trent University. Her area of research is the motivation and behaviour of learners in further education. She is the author of several books for teachers. 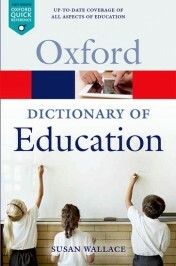 She is the editor of A Dictionary of Education.